Active in her community for over 40 years, Fay Hill realized her local park and fallen into a terrible condition, so she gathered together a group of women and decided to do something about it. From there, Volunteers for Springfield Park was born. Now the Executive Director and Secretary for Volunteers for Springfield Park, Fay leads the group in efforts to improve and maintain the condition of Springfield Park by partnering with businesses, schools, churches and neighbors. They started a flower garden, attended Partnerships for Parks workshops, worked on grant applications for better equipment, and all pitched in to help beautify their park. With the assistance of City Parks Foundation’s SummerStage, and local elected officials they have hosted several concerts in the park. The Volunteers also make efforts to recruit young residents to teach them about the importance of park stewardship and maintaining Springfield Park for years to come. 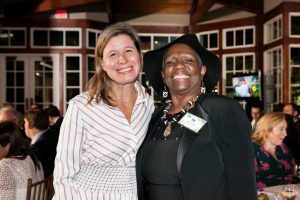 Fay remains active in her community in other ways as well, serving as the Parks and Environment Committee Chair on Community Board 13 and mentoring volunteers for Partnerships for Parks, for which she received the 2014 Golden Trowel Award for Queens. Thanks to dedicated advocates like Fay, communities across NYC come together to care for their precious green spaces. Help us continue to support volunteers like Fay and the work she does for her community – make a gift to NY4P online today and your donation will be matched now through #GivingTuesday.